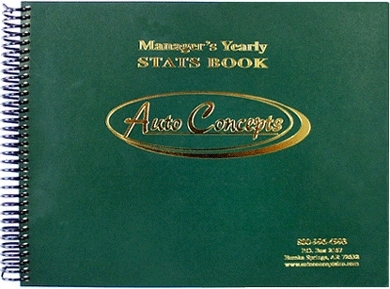 The Manager's Yearly Stats Book is broken down into 12 one-month segments. Each monthly segment contains 30 Manager's Daily Plan pages, a Monthly Totals page and a Forecast Page. It also contains a phone directory for frequent contacts and a NADA directory. The top portion of this page works as a day planner, where the manager can list his scheduled appointments, scheduled meetings and things to do. The bottom portion is where the manager will list his entire sales staff and log their daily activities and results. 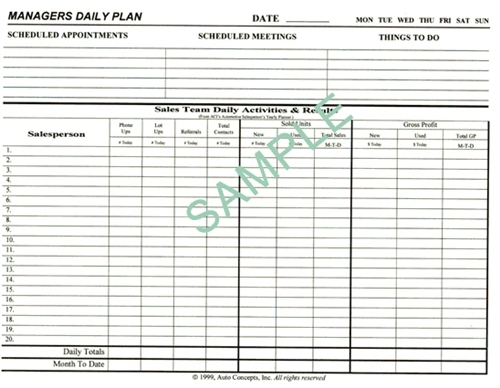 This page offers the manager an excellent way to schedule his day and keep up with the activities of his sales staff. 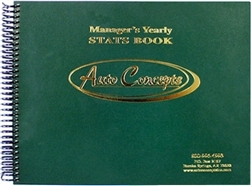 Summarizing each month is the Manager's Monthly Totals page. Simply by taking the totals from the last day of the month you can calculate gross profit averages as well as the top salespeople. This page provides an excellent way for the manager to better understand the correlation between contacts and gross profit as well as which salespeople are performing. The Manager's Monthly Forecast page starts the next month. This page is used to review last month's results and forecast the next month. The manager can also list any recommended training or advertising based on last month's performance. By using this page the manager can more accurately forecast his next month's sales.